THE MAXIM of German drummer, composer and bandleader Jochen Rueckert is certainly meritorious as his quartet releases We Make The Rules, captured following an international tour: “I’m getting a little allergic to ‘project style recordings’, where you play music in the studio without being able to fine tune it on the road. All said and done, the music on the album was recorded in only seven hours and six of the tracks are first takes, the rest second takes. The perks of having a working band!”. That ethos is palpable in the assured immediacy of his interaction with fellow NYC-based band members Mark Turner (tenor sax), Lage Lund (electric guitar) and Matt Penman (acoustic bass), with whom he has worked for the last few years – all nine numbers here were written specifically for this grouping. It’s a sequence that requires ‘total immersion’ to fully appreciate its experiential depth, as these musicians are experts in detail and have evidently honed Rueckert’s technical, written frameworks before embarking with their panoply of break-loose extemporisations – there’s never any sense that this quartet is safely going through the motions. The luxuriance of Mark Turner’s tenor is immediately apparent in opening number Eggshells, perfectly matched to the mellow solo and chordal reverberations of Lage Lund’s guitar; and Matt Penman and Jochen Rueckert provide its sensitive, detailed rhythmic buoyancy. Pretty From Afar displays a similar line of accomplishment, with a freer central section which finds guitar and sax weaving ideas together, the balance beautifully observed; and fans of TV’s Breaking Bad, take note – Saul Goodman swaggers to fine bass work from Penman (‘s’all good, man!). Title track We Make The Rules is delightfully ebullient – and Rueckert, though never dominating proceedings, underpins his three colleagues’ improvisations with increasingly strident, ticking complexity. Slow ballad Bess glides unerringly to the softness of bass and drums, Turner’s congenial tenor lines melding effortlessly with Lund’s lusciously-woven chords; and there’s a mischievous streak to The Cook Strait which invites a more open dialogue amongst the quartet. Rueckert’s cerebrally-intended Alloplasty is characterised by the enhanced echoings of Lund’s guitar, and the entire sequence ripples pleasingly to impressive drum patterns and Turner’s eloquent searchings. Following, the faster swing of Yellow Bottoms encourages Lund further into the spotlight with his measured-yet-leftfield creativity – a joy to hear; and finally, Manong Twilight At The Whatever Hotel (inspired by an artwork by the composer’s late jazz aficionado uncle) comfortably relaxes into a sublime, soporific haze in which tenorist Mark Turner basks. 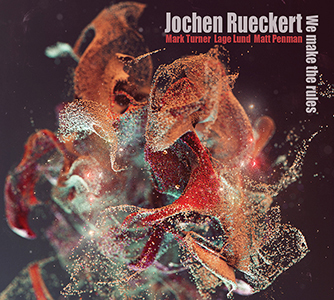 Jochen Rueckert’s Whirlwind debut may not shout out strongly memorable melodies or revolutionary techniques – but it radiates an understated warmth and sophistication which is so very appealing. Released on 13 October 2014, visit the We Make The Rules album page for further information, audio samples, promo video and purchasing.